Read this story to find out how Sue's loving husband and their 4 children helped her improve her everyday life despite her secondary progressive MS.
Sue, Martyn's wife, was diagnosed with secondary progressive MS in 2002. Since then Martyn and his 4 children have done everything to provide Sue with a comfortable and safe home and improve her everyday habits, which helps her manage her MS better. Hello Martyn, you are the carer for your wife Sue who suffers from MS. Can you please tell us a little about your wife and yourself? Sue is 59 and I am 60. Sue has always had a very optimistic character, her glass is always half full rather than half empty . I am reasonably patient, but when tired not so much. We have four children, three boys and a girl aged 30, 28, 26 and 24. They have been a great help with helping Sue to cope with the MS, taking her too the toilet, transferring her to a wheelchair and generally being very helpful. We have a golden retriever and a labrador and two budgerigars. We are both committed Christians with a strong faith which has helped us cope with the MS and Sue has a BA honours in geography and grade 8 clarinet, grade 8 singing and grade 7 piano, Eight years ago she managed to pass her grade 7 and beat our youngest son by three points much to his disgust. Sue is one of four children, none of whom have MS and there is no MS as far as we know in the family. Her ancestors come from the Shetland Islands which are north of Scotland and reputed to have the highest rate of MS in the world, possibly due to a lack of sunshine. I was a country auctioneer in Norfolk for thirty three years, retiring in April this year, and was awarded the MBE by The Queen for charity fund raising grossing £350,000 through promises auctions in 2008. For the last 16 years I have worked part time helping to look after the family and looking after Sue and found it very rewarding. How was your wife diagnosed with MS? What was your reaction and your first steps? In 2001, Sue had an aching wrist which was diagnosed as either carpel tunnel syndrome or MS. She was diagnosed in 2002 with secondary progressive MS through a lumbar puncture and MRI scan. We knew very little about MS, but knew that Jacqueline Dupres, the cellist had died of MS. She now has PPMS. Sue is a retired teacher. Was she still working at the moment of the diagnosis? How did the illness affect her professional and everyday life, and yours as well? After the diagnosis Sue carried on teaching for the next four years at a local primary school. She had told the headteacher, who was sympathetic, but one day she fell off a stool, putting up children’s work and had to have six weeks off work. When her writing became too difficult her head teacher suggested that Sue ought to retire. She carried on singing alto in a local choir and still drove an automatic car in 2005. Although this put a lot of work on to me, our four children were brilliant, they can all cook and they all took turns in cleaning the house and general chores. By that time I was working one week a month and Sue had got her teachers’ pension. At first, we didn’t want to know how the MS would progress. We went to a local MS therapy centre which was helpful. What treatment did she get for MS? How efficient was it? Sue’s treatment started with sleeping pills, when the stomach banding started, Gabapentin was prescribed together with Vesicare for bladder contractions. Amitriptyline was prescribed for the nerve endings. We bought an Oswestry standing frame for exercise and cycle exercise machine much later and Sue had pads and eventually had a catheter inserted. This saved an awful lot of washing clothes. We think the treatments were effective, but we do wonder how much the improvements in Sue’s MS are down to diet. Your wife has been following The Wahls Protocol diet [an approach to healing chronic auto-immune conditions with the help of a nutrient-rich paleo diet, developed by Dr Terry Wahls]. Could you please tell us more about it? In March 2015 Sue was so poorly and fatigued that I wondered whether we would have to put her into a care home. It was a very trying and frightening time for the whole family. With a lot of church support, prayer and NHS intervention, I eventually discovered the Wahls Protocol 18 months ago on the Internet. It required us to eliminate dairy, gluten, potatoes, pasta and rice from our diet and we substituted these with sweet potato, almond milk and lots of vegetables and grass fed meat, fish and offal. The results have been astonishing. 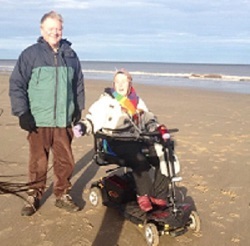 Although Sue is still wheelchair bound, her energy levels have risen considerably and her fatigue is much reduced and her cognitive thought processes are much improved. I am on the same diet and have lost nearly 2 stone, we have also given up sugar and learned a lot about nutrition which benefits the whole family and our friends, whether they like it or not. Sue has a lot of hobbies: gardening, visiting, travelling ... How does she manage to lead an active life with her MS? Has she any tips to share with other MS patients? Due mainly to the diet, Sue’s health has greatly improved and therefore her ability to garden, visit and travel are much improved. We have bought a lot of disability equipment from eBay including wheelchairs and scooters. I have made raised beds and we have ramps into the house. Our occupational therapist found us a hoist for when she falls over on the floor and we have hoists around the house if needed. Sue’s advice to other MS patients is to keep busy, have a daily routine and don’t allow yourself to get depressed. We have a very close and intimate marriage and therefore I want to help her do her hobbies. You mentioned that you have adjusted your home and your camper van to match Sue’s comfort and needs. What exactly did you do and how does it help Sue in her everyday life? We paid for a stairlift, wet room and NRS provided hoists and ramps and handles in the house. We raised the sofas and bought Sue an electric reclining chair in our local auction. We have a portable air-conditioner for the very rare occasion when Britain gets hot. I modified our six meter motorhome with a hoist to lift her from her wheelchair into the passenger seat and we have a small wheelchair to take her to the rear where we sleep. We carry a small portable toilet and I have modified the shower. We also have a drive away awning. What other conditions does Sue have and how does she manage them? Sue was diagnosed with Type II diabetes in 2013 and treated by diet, in 2014 she was prescribed medication and in 2015 two consecutive blood tests revealed that she no longer had diabetes and we put this down to the Wahls paleo plus diet. In fact the diet was beneficial to both MS and diabetes and is also highly beneficial for other autoimmune conditions. You have recently joined Carenity. What are your first impressions? What are your expectations? I haven’t yet worked out all that Carenity has to offer, I am a member of “my MS team” and hope to get the same benefits from Carenity. I think Sue will benefit from other people’s advice and encouragement as it can be a lonely place on your own. We hope that we can advise other people about the diet and encourage them to try it. Does Sue have a message to send to other Carenity members suffering from MS? What is it? Sir Winston Churchill once said “Never, never, never give up,” this is the motto which we live by and that is the advice which she would give other people with MS. Also, to keep on adapting to your circumstances and always have something to look forward to.